Traveling with little ones is no joke. If you are anything like me and loved to explore and see the world pre-kids, it can seem daunting to begin doing that again after having them. The flight, the gear, the time changes, food, accommodations. I get tired just thinking of it. Before summer kicked off, I started to get true wanderlust, going online and reading about Positano, Barcelona, Argentina, Tokyo...my husband would give me the side eye, indicating there was NO WAY we were dragging our 4 and 6 year old anywhere out of California’s driving distance. Then, an incredible opportunity with Adventures by Disney came our way and it was literally the answer to our prayers! We could travel to Ireland with our 6 year old, and once it was booked, we could simply sit back and enjoy. I kid you not. Adventures By Disney plans and curates your ENTIRE trip! Meals, accommodations, daily activities and all transportation. From the moment our plane touched down in Dublin until the moment we stepped back on to it after the best 9 days ever, we didn’t have to lift a finger. Oh, except to eat pastries in a castle -- but don’t worry, we’ll get there. When you go to Adventures By Disney’s website HERE you can see all the locations they go to, which basically covers every continent and city you could ever want to visit. I’m already plotting our next adventure! 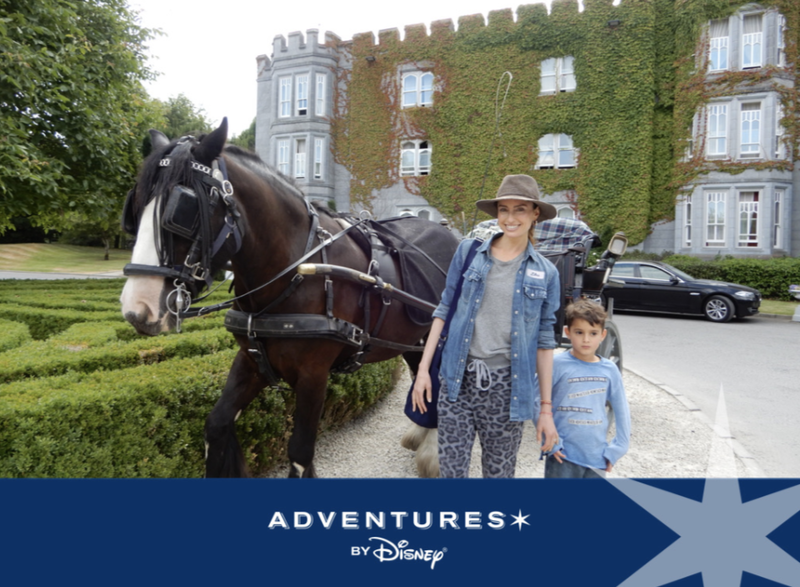 Here are some of the highlights of our Ireland adventure and I will reference how they made each experience kid and family friendly! Watch my video recap right HERE! I grew up riding horses, and have ridden horses in Hawaii, Italy, Canada, and Malibu, but riding a horse through the dewy fields of the Irish countryside surrounded by grazing sheep? There’s nothing like it. I felt like I was living within the pages of a romance novel. My 6 year old and I rode side by side while his horse was guided on a rope by one of the staff. The Epic Museum is The Irish Emigration Museum and taking kids here is a must! Every room has kid friendly interactions and activities all while educating kiddos and parents about Ireland’s rich history and famous citizens throughout history. My 6 year old loved exploring this island, spotting deer and walking the maze like structure situated in the centre. The boat ride there and back is also a fun adventure! My son created an art project when we returned home called The Flying Boat. He loved learning about the first “flying boats” that crossed the Atlantic and we got to walk in one and also they have a children’s zone where he used a flight simulator. I won’t lie, I felt quite local walking around these towns. I almost wanted to try an Irish accent, but I didn’t want to freak out the real locals. My little guy loved running around in the parks in each town we visited, trying out the local restaurants and simply just “being” in Ireland! Lahinch - a great surf town! My son got to learn all about the national sport in Ireland - Hurling, and try his hand at it! This was such a fun day and a must with kids! At Rathbaun farm I got to feed a sheep, make scones, and eat a real Irish Farm meal while listening to a man play Billy Joel on piano! Rathbaun Farms truly encompasses what rural Irish life is like. They are trying to bring back the Farm to Table goodness that essential to Ireland. I ate the best goat cheese I’ve ever tasted, spent hours outdoors watching a Border Collie round up sheep, and daydreamed about packing our whole lives up and moving there. My little guy got to feed a baby sheep, listen to live music and he was fascinated with farm life in Ireland. 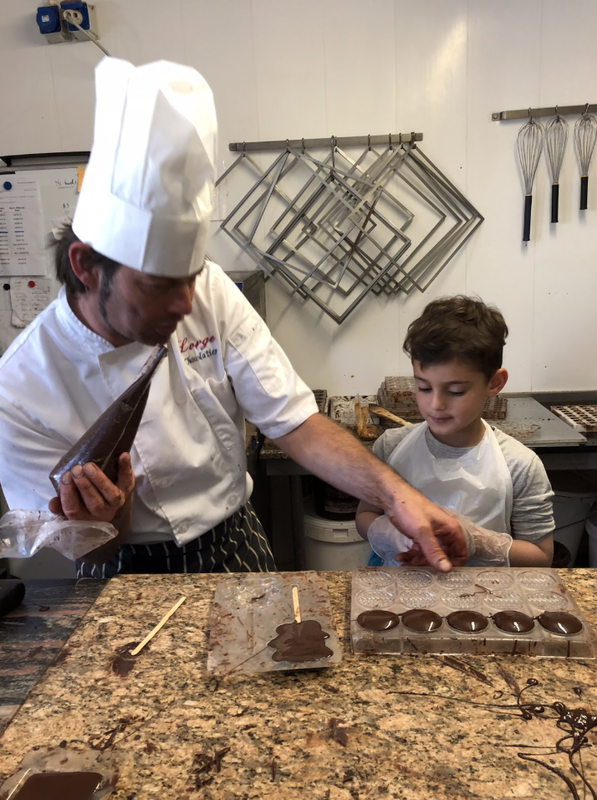 Take a kid and teach them to make chocolate and then eat it -- you are basically winning parenthood, right? My kiddo learned how to make yummy confectionaries, and we even took a chocolate quiz! This was so unique and I loved learning how some the finest chocolates in Ireland are made. Exploring these caves was truly a highlight! We learned about the explorers who discovered them, and even got to experience what it was like for them by turning off all the lights! Not for the faint of heart of anyone who is claustrophobic, but my 6 year old loved this! It’s true, there are many castles in Ireland and some of them, you get to stay in. Dromoland is like none other. Converted years ago into a luxury hotel and spa, this castle transports you back to the time when people lived in kingdoms and Lords bet their castles over card games at the pub (this is a true story about the former Lord of Dromoland). You don’t have to leave the grounds during your stay, there are restaurants, activities, a pool, spa and golf course.